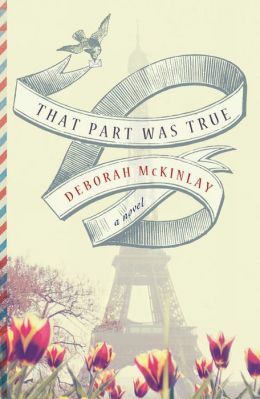 By combining an epistolary with a few recipes and some self reflection, Deborah McKinley’s novel – That Part Was True – offers a romantic tale of two characters who live a sea apart but are confronting similar mid-life doubts. They inadvertently help each other through their letters and a mutual love of food, and possibly live happily ever after – but you will have to decide. If you enjoy stories by Penelope Lively and Eleanor Lipman (her review in the New York Times motivated me to find this book), you will appreciate McKinley’s nuances and the familiar thoughts that surface in the characters’ relationships. Curiously, reading their descriptions of how they each prepared favorite foods made me hungry, and the informal recipes sprinkled throughout the narrative were my favorite parts. McKinley includes a recipe for peanut cookies that Jack makes in the middle of the night to cure his insomnia. Worked for me too. Cream the butter and sugar; add the beaten egg; then mix in the sifted flour, baking powder, and cocoa; and last, add the cooled peanuts. Place spoonfuls on tray(s) and bake at 350 for about 15-20 minutes. This entry was posted in authors, book review, books, cooking, reading, romance and tagged Cookie, cooking, Deborah McKinley, Eleanor Lipman, English countryside, Home, London, mid-life crises, New York Times, Peanut butter, Penelope Lively, That Part Was True, writers, writing. Bookmark the permalink.